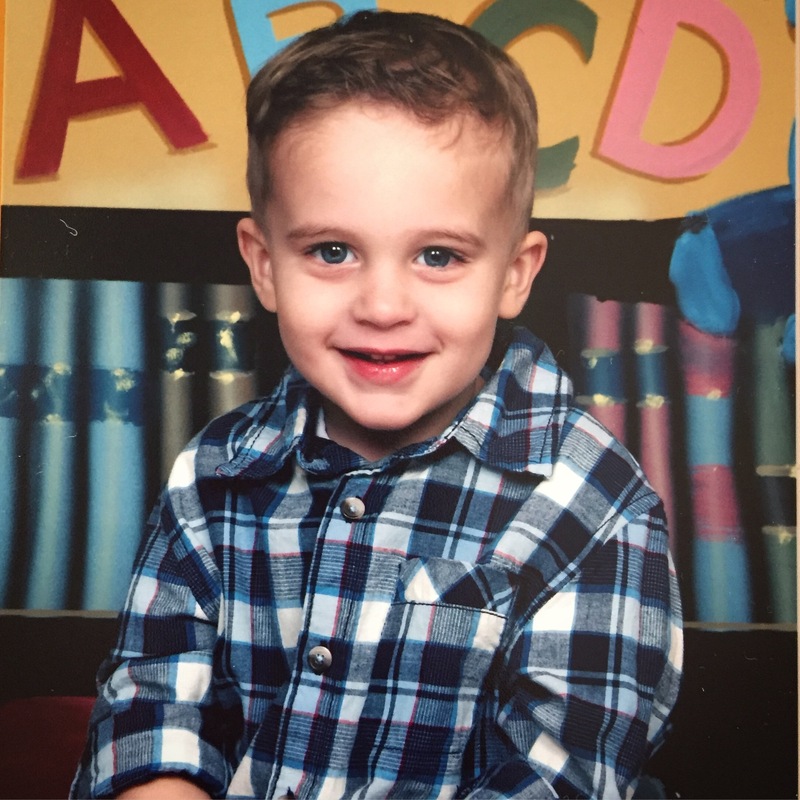 Today I got my sons very first preschool picture and it made my heart smile. 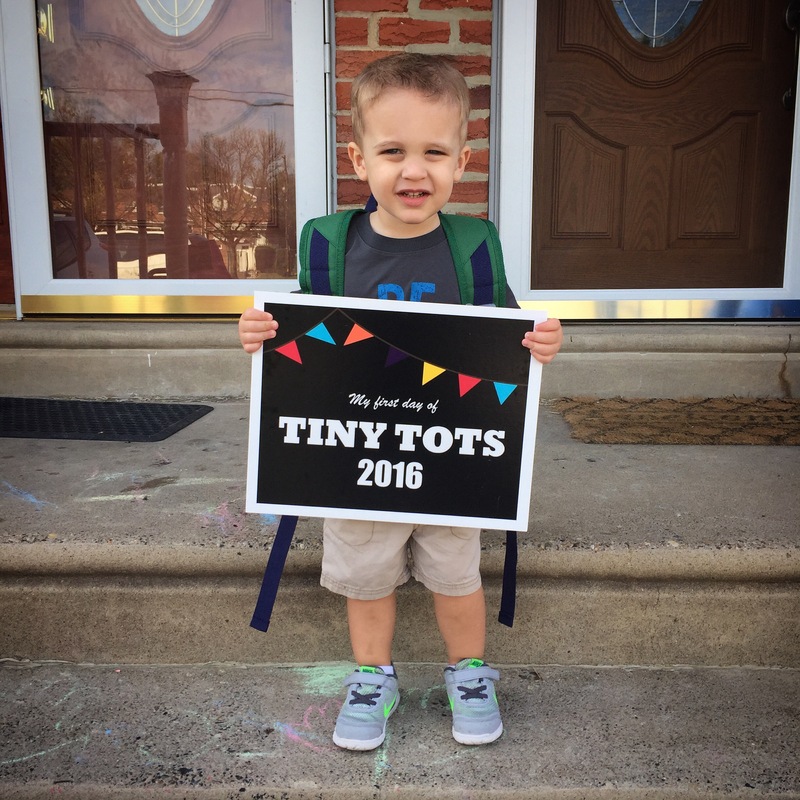 He isn’t technically preschool because he is 2, so they call them the tiny tots program. I work as a permanent makeup artist one day a week and I also do hair and makeup for weddings on the weekends so I was having such a great time being able to be home with my baby but I wanted more for him. We got a recommendation of a program that the YMCA runs. It’s either a 2 or 3 day class for 2 hours and they start at 2 years old. It was great having Jake at home with me but I wanted to expose him to some type of schooling and give him a chance to interact with kids his own age. After careful consideration we decided to start out with 2 days and see how it went. For anyone who had a child in preschool, drop offs in the beginning are pure torture. The only people I ever left him with was family and now he is being left with strangers and expected to behave. I thought, there is no way this is gonna go well. Day one, to start out, was great. He was so cute in his new school clothes and was so excited to wear his backpack. I got him out the door and took a few pictures and got him in the car with no problems. When we got there he was totally fine. Jake is rather shy so he made me hold him as we lined up with the other parents and children in his class. At 9:30am the gate opened and we where told to just hand our child off to the teacher and walk away. He walked in like it was nothing as the teacher guided him down the path. As he made his way to the door to school, he turned around and realized I wasn’t coming with him. At that moment the melt down began. Guilt filled my body as I had to walk away from my child and not comfort him. Would he be tormented for life that I just left him with strangers? Would he never forgive me? Would he ever stop crying? My mind was going crazy. My tears didn’t wait till I got to the car, they just flooded out uncontrollably. I drove home from drop off thinking I would have two hours to do laundry, clean the kitchen, or do anything that was productive. Instead I sat on my couch with my keys still in my hand sobbing. Those two hours felt like a lifetime. 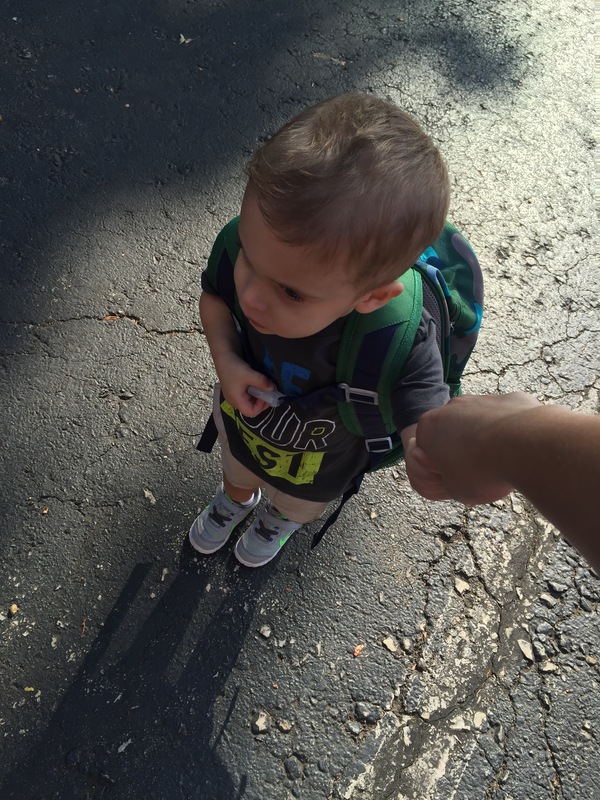 As I returned to pick him up from his first day of school, I was a nervous wreck. Was he gonna hate me? I hope not. As the gate opened for us anxious parents, we rushed in the see our babies. It was a little chaotic when we all entered the classroom but it was the first day and all the kids where excited to see their parents. The teacher assured me he didn’t cry the entire time and although it should have given me relief, I couldn’t help to still feel guilty. The next day we had off and I gave him extra cuddles to make up for leaving him at school the day before. When Thursday came, he new the routine I was starting and he didn’t like one bit of it. I anticipated the second day being the worst but not like this. 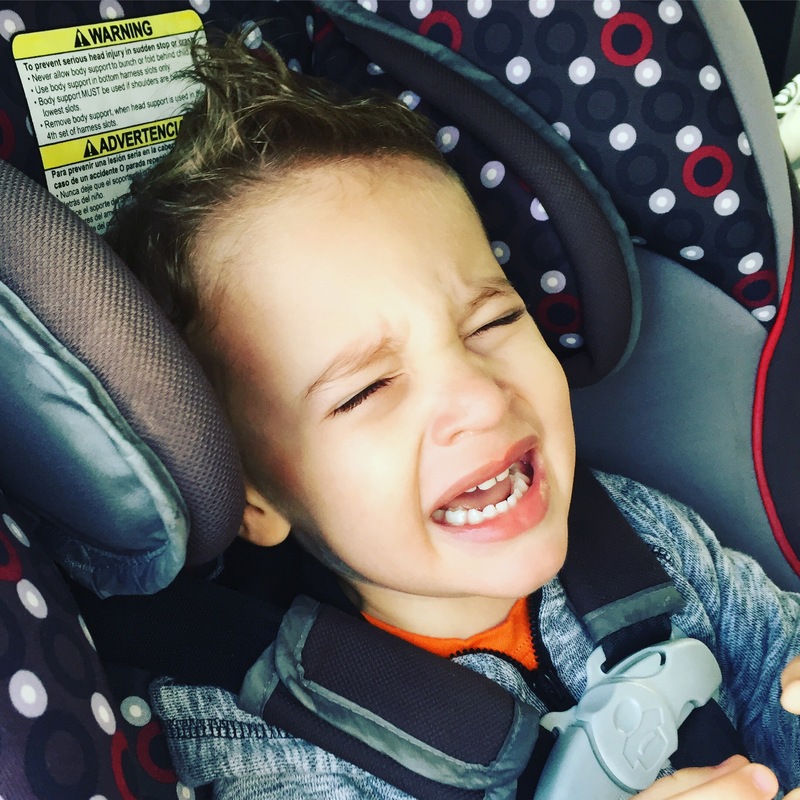 He cried getting dressed, he cried walking out the door, he threw a fit getting into the car and cried the entire ride to school. 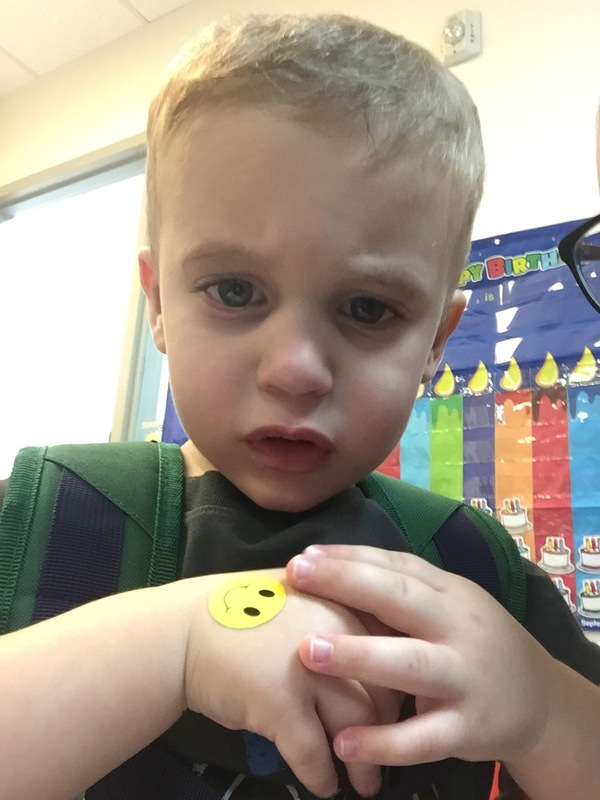 Drop off was terrible and the teacher had to pry him from my arms. Again I went home sobbing. This wasn’t right. How could I be doing this to my child? Was I a bad mom for putting him through this? Should I just forget about school and never make him go back? When the next week came I sucked it up and continued on with our routine. He still protested some what but it wasn’t as bad as the second day. He started to cry as we pulled into the school parking lot. I got him out and put his back pack on and walked to our line to wait for the teacher. I asked him if he wanted to get down, he said YES! Maybe this was progress? As the teacher opened the gate she held out her hand and he willingly took it and walked down the pathway with her. He was still crying but I felt a little bit of hope that maybe this was a good thing for him. When I returned to school to pick him up that day, he was sitting quietly at his table along with all his classmates. It was like a totally different classroom. There where no crys, no melt downs, just the cutest 2 year old waiting for their parents. Each drop off began to get easier and easier. There where no fights anymore and he was genuinely excited when I asked if he wanted to go to school. There are still a few days here or there that he says “NO WAY” but as soon as he sees his teacher and his friends he is totally fine. I couldn’t be happier with the program I chose for my son, I’ve seen such progress in his speech and interaction with other kids. They send home projects that they do in class and have a break down of everything they have the children do each day. It so great to see the progression he is making and being able to see his adorable school picture makes it all worth it. He is happy so now I am happy. I have to say in closing, I give all the working moms out there a ton of credit. I send my son 2 days a week for two hours and feel guilty. I couldn’t imagine what it feels like 5 days a week. You are so amazing for doing your thing and working so hard to provide for your family. Starting preschool at age 2 isn’t always the right choice for families but I’m so glad that I signed him up. I wish I could be the awesome stay at home mom and give him more but to be totally honest I’m an average mom that needs a break and what better way to get it then to send him somewhere where he is learning something. We are all on our own path and I don’t judge anyone. Do what’s best for your family and cherish your children. They grow up way too fast!! It’s amazing how our outlooks can change with new experiences! He’s so adorable!